Nearly 200 previously unreported U.S. diplomatic cables were posted on Thursday to the website of Lebanese newspaper Al Akhbar. The cables, from eight U.S. embassies across the Middle East and North Africa, have not appeared on Wikileaks’ official website or in the Western media outlets working with Wikileaks. Al Akhbar, which defines itself as an “opposition” newspaper, is published in Arabic. It has posted all 183 cables in their original English but promises readers a forthcoming Arabic translation. It’s unclear how Al Akhbar got the cables, which they say are “exclusive,” and whether they posted them with the permission of Wikileaks, which has tightly controlled who publishes which of its cables and when. Wikileaks offered a handful of media outlets, such as The Guardian and Spain’s El Pais, advance access to some cables on the condition that they coordinate release. But neither Wikileaks nor those media outlets have released the same cables posted by Al Akhbar. If Al Akhbar had coordinated their release with Wikileaks, it stands to reason that the Lebanese publication would have been granted sufficient advance time to translate the cables to Arabic. The documents appear to be authentic as the cables from Tripoli match up with The Atlantic’s background reporting for an earlier story on a 2009 Libyan nuclear crisis, some details of which The Atlantic did not publish but nonetheless appear in Al Akhbar’s cables. The rest of the cables are from U.S. embassies in Iraq, Egypt, Lebanon, Algeria, Mauritania, Morocco, and Tunisia. They portray U.S. diplomats as struggling to understand and influence the region’s oppressive and sometimes unpredictable regime. One series of cables from Baghdad reports that Prime Minister Nouri al-Maliki replaced hundreds of his most experienced intelligence and security officials with under-qualified “political officers” in advance of the 2010 Iraq elections. Another series from Beirut in 2008 shows Lebanese Defense Minister Elias al-Murr telling U.S. diplomats, in a message he implied they should pass on to Israeli officials, that the Lebanese military would not resist an Israeli invasion so long as the Israeli forces abided by certain conditions. Murr, apparently hoping that an Israeli invasion would destroy much of the Hezbollah insurgency and the communities in Lebanon’s south that support it, promised an Israeli invasion would go unchallenged as long as it did not pass certain physical boundaries and did not bomb Christian communities. A U.S. embassy official wrote, “Murr is trying to ascertain how long an offensive would be required to clean out Hizballah in the Beka’a.” Murr added that he had discussed the plan with then-Military Commandant Michel Sleiman, who has since become the President of Lebanon. The small but vibrant community of Middle East-based, English-language Arab bloggers have expressed outrage at Murr and Sleiman’s apparent invitation, predicting it will bring political disaster and possibly worse. “New leaked cables are coming from weird sources, think tanks, the countries involved. There’s a lot of stuff being quoted in local press from cables that haven’t been released yet and I have no idea where they are coming from,” this lobbyist said. It remains to be seen if Al Akhbar will translate the cables for its Arabic readership or even keep them posted online. 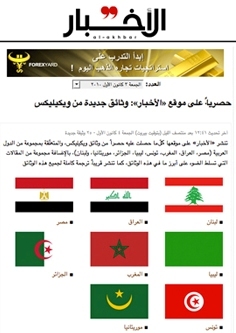 Much like Wikileaks.org, which has gone down several times since posting the cables and had its hosting pulled at least twice, Al-Akhbar.com has been increasingly difficult to load since it posted the cables. While that could be the result of a spike in traffic, media attention on Al Akhbar’s exclusive cables has been relatively sparse. But, for the moment, you can still view all 183 cables here. wlek tfou 3a hek 3alam mitel el MURR!!!! I am ashamed that this guy is an orthodox!! tfeh miten marra! 7ayawen ka-annou el ness bil jnoub mish 3alam wou mish libneniyeh!!! bass el christians and the sunnis are lebanese! shame on you murr!! so let me get this straight, people are mad at elias el murr who wanted to oust an armed militia who has been holding the country hostage for too long now? yeah for sure those getting mad about it arent a bunch of brainwashed trolls. and elias el murr is evil for wanting a vibrant state without another hegemonic state within its borders. all this and no one knows if the wires are even legitimate? “they look legitimate” is the best they can do? how about verification with other sources? oh right al akhbar is the only one who has those wires loool noooooo it doesnt sound fishy at all. well lets see, time will tell whether these wires will be like the “indisputable evidence” that zabrallah had of Israel’s complicity in the killing of hariri (surveillance photos from 1995.. lmfao at the stupidity of some people who buy into their propoganda). this isnt a country, it’s a ZOO anymore. the precipitous increase in Israeli overflights of Lebanon. Lebanese Army when/if Israel invades to counter Hizballah. between the sale of homes in Jezzine and Hizballah planning. means that Nasrallah is on high alert. Hizballah will not have a visible presence in these areas. the fight in the Beka’a Valley will be very different. the main forces, the rockets. some of the Israeli response to their attack, he added. serve in the Syrian military reserves. pressure the MinDef into agreeing to fifty weapons permits. drive up to Aoun’s house in the protected enclave of Rabieh. Christian traditions by backing Hizballah. control his increasingly severe diabetes. Murr’s concern that an Israeli offensive might be imminent. waiting for the top secret wires between hizbilkhara and iran and syria … as if that would ever happen… if those wires ever got out, we would really have something to talk about then. as far as these “wires” are concerned, i see nothing wrong in what elias el murr said, keep in mind hizbilkhara didnt consult with the government in 2006 before kidnapping the Israeli soldiers and causing the war, why do you think the government has any need to consult with hizbilkhara over anything? especially when it comes to national security. if things had played out as said in those wires, el murr would have been responsible for keeping our military intact and the majority of lebanese out of the conflict. hizbilkhara cannot drag us all lebanese into their adventures, and they have proven that they wont hesitate to do it .. ie: 2006 war. hizbilkhara wants wars with israel, then they should go at it by themselves and we lebanese should do all in our powers to safeguard ourselves and stay out of the way. hizbilkhara’s ideologies can not be forced upon us. Elias Murr is a Patriot.